ELEVATION: 5260 Ft. / 5089 Ft. Follow I93 into Franconia Notch and park at Lafayette Place. There are parking areas on both sides of the highway with a tunnel connecting parking lots. DESCRIPTION: From your parking are ascend the paved sidewalk to the Falling Waters Trail. 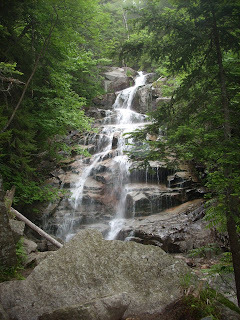 The trail crosses, follows and re-crosses Dry Brook as it passes 4 -5 sets of waterfalls each more stunning than the last. The most recognizable of the falls are the 30 Ft tall Stairs Falls, 60 foot Swiftwater Falls and 80 foot Cloudwater Falls. The steep ascent is bearable knowing another beautiful waterfall looms not much further ahead. The trail eventually climbs the steep mountainside of Little Haystack and reaches an outlook known as 'shining rock' a short distance below tree line. At 3.2 miles you reach the 4760 foot summit of Little Haystack. 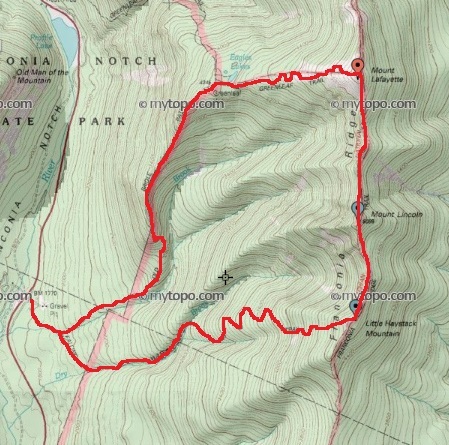 Continue 0.7 miles north along the open and barren Franconia Ridge Trail to the 5089 foot summit of Mt. Lincoln. Mt. Lafayette is another 0.9 miles north. The open ridge is high and narrow with steep slopes on both sides. Be cautious of weather conditions as there are not a lot of bailout or hiding spots along the exposed ridgeline. From the Mt. Lafayette summit follow the cairns marking the Greenleaf Trail as it steeply and rockily descends west towards Greenleaf Hut. From the hut follow the popular Old Bridle Path 2.9 miles down the steep ridge through scrubby growth with passages of open rock as you descend. Here you will see dramatic views of the Lafayette Summit and the steep Walker Ravine. Franconia Ridge is the scarred and steep rocky ridge that towers 3000 feet over I93 as you pass through Franconia Notch. It provides excellent alpine hiking and include four mountains over 4000 feet tall. The ridge can be traversed in an entire day however would require a road walk or car spot. The Appalachian Trail traverses the ridge and almost 10 trails provide access to Franconia ridge. Each of the waterfalls along the Falling Waters trail are spectacular, Stairs Falls is the upper left photo and Swiftwater falls is the upper right. Shortly before tree line the short side trail to "shining rock" is worth the visit. 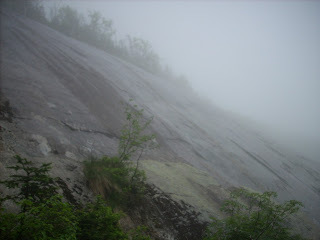 In wet conditions the slick granite rock face acts as a mirror reflecting the sunlight off the giant cliff face surface. 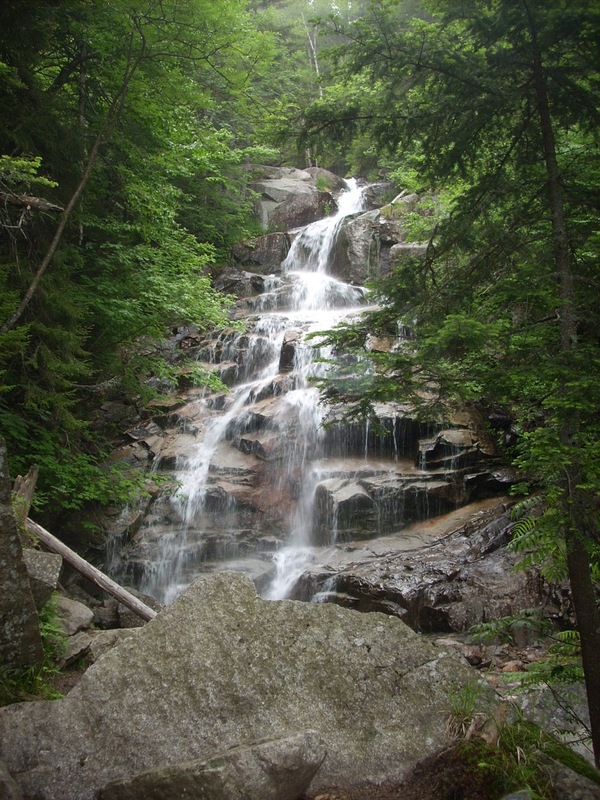 The Franconia Ridge Trail offers stunning views deep into the Pemigewasset Wilderness to the east and of Cannon Mtn. cliffs to your west. The classic route ascends the Falling Waters trail and descends the Old Bridle path however can be climbed in either direction. 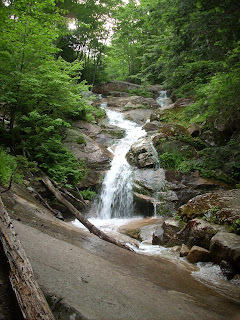 This is one of the most popular hikes in the White Mountains and you will find hikers of all ages and experiences during your journey.